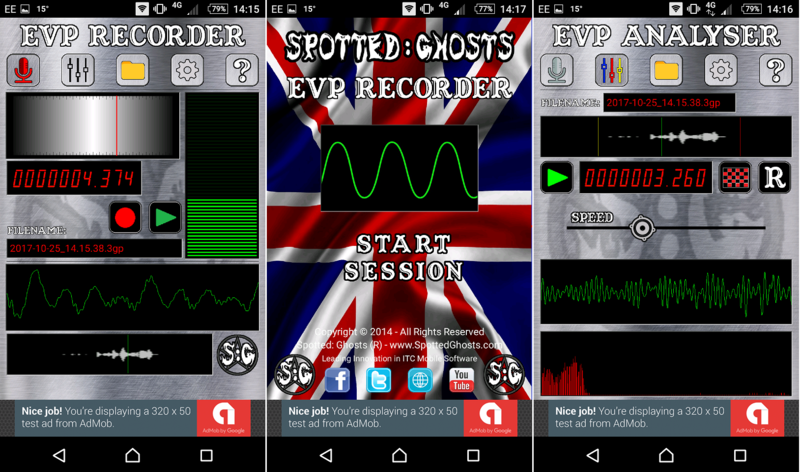 Version 4 of our EVP Recorder is NOW available. This is a handy tool to have with you when doing Paranormal Investigations or Ghost Hunts. We are not saying that spirits will speak to you through our app, so please do not be disappointed if it does not work straight the way. Record on Sound Detection - Only available to Registered Users. There is an EVP Analyser, where you can change the speed / pitch of your recordings and set start / stop positions for playback. A folder is created on your device called "SpottedGhosts", in there you will find folders for all of our apps. Go into the "EVPRecorder" folder, then into the "Recordings" folder, here you will find all your recordings as .3gp. You can now share your .3gp files. There is a Help section, which contains a link to our latest Tutorial Video on YouTube. You can now register your app with us, which will give you access to all of our latest enhancements / functionality and to receive our newsletter. We only collect your name and email address in order to register your app with us, we do not share this information with anyone! This app was recently used on a new Paranormal show called Celebrity Haunted Hotel, Whoop!! Yes we know, everyone hates adverts right? Well, I think you should look at adverts as a good thing, they are a way for you to help to financially support the developers, without actually paying the developers any money. So please don't be annoyed with the adverts in this app, they are there to help us finance the development of new features for you, the users.